Whether large or small, decorating our homes and apartments is one of the great joys of having one in the first place. It can be stressful at times, but with the right guidance and a clear understanding of our own ideas it's pretty achievable, and equally rewarding. 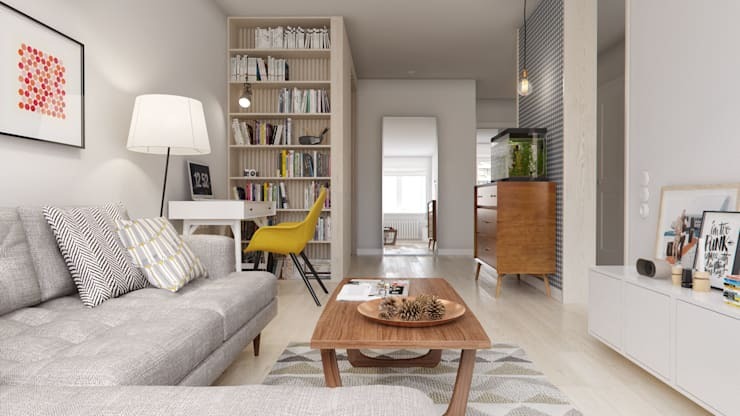 One of the best ways to find inspiration is obviously to look to what has already been crafted and created by those with an affinity for interior design, such as the professionals from INT2Architecture who have presented us here with one of their most beautiful apartment designs. From the living room to the bathroom, not one element is misplaced or missing. What's even more impressive is that they've managed to stick to a theme while simultaneously ensuring that each room has individual depth and character. Take a look for yourself, and let us know what you think… or if you get inspired! The beautiful wooden coffee table dominates this view and complements the sideboard in the hall area stunningly. From another angle we get a full view on the office space, which is literally and metaphorically book-ended on one side by the impressive floor-to-ceiling bookshelf on the right. 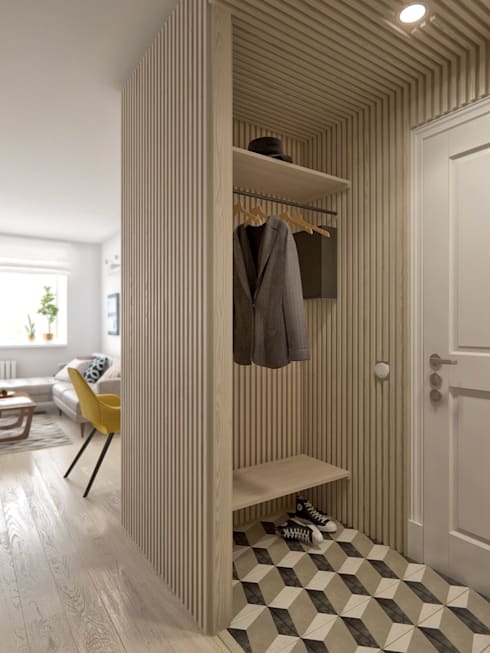 The main qualm of apartment living is having nowhere to store out stuff or hang our clothes—that's why making use of little books and crannies is a great idea. 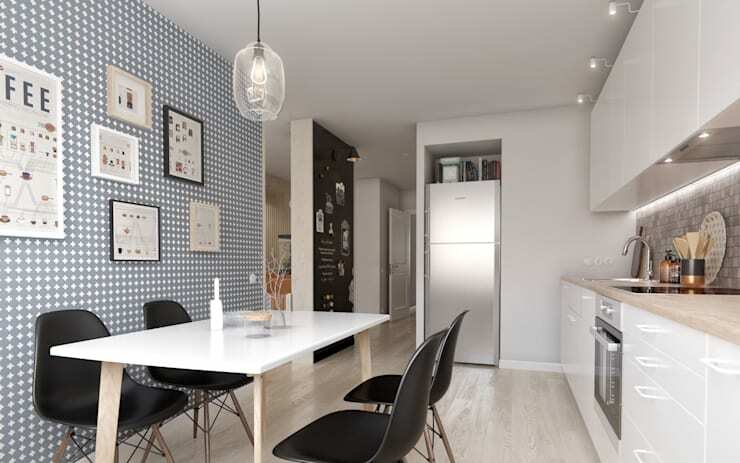 If you have a one wall kitchen with a bit of space, opting for a dining table can be a great, multi-functional idea. Instead of bed-side table lamps, the team have opted for the low-hanging ceiling variety, and the result speaks for itself. 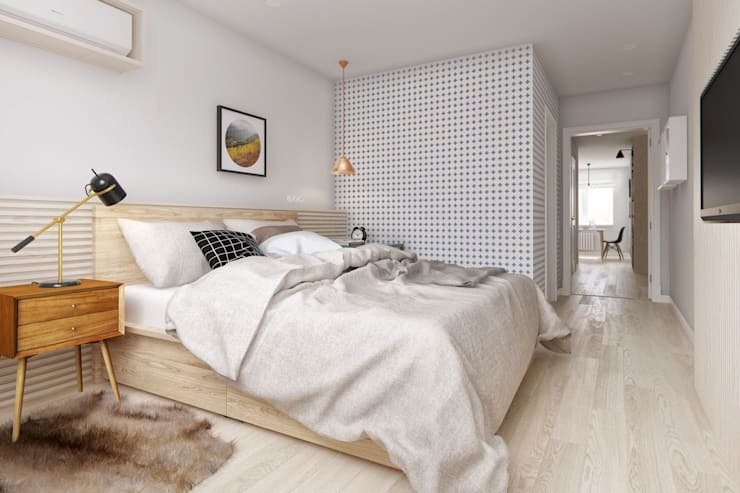 This room has a completely Scandinavian vibe, which brings a relaxing balance of warm and cool tones. 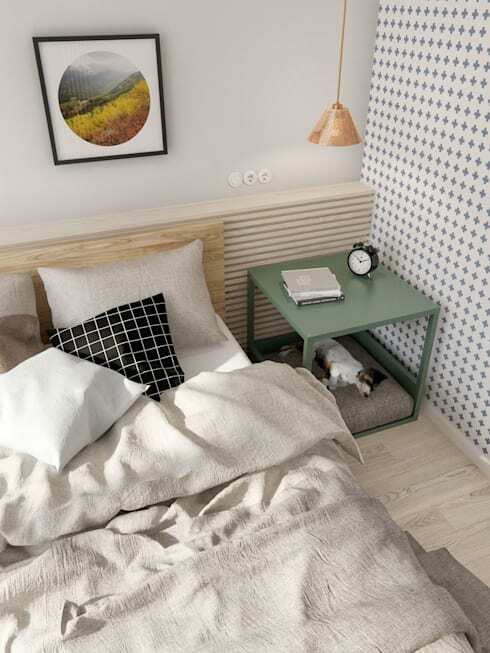 This is one of the most adorable pet-bed ideas that we've ever seen! If you like your pet to sleep in the bedroom with you but don't want them to actually get up onto the bed… consider this option. 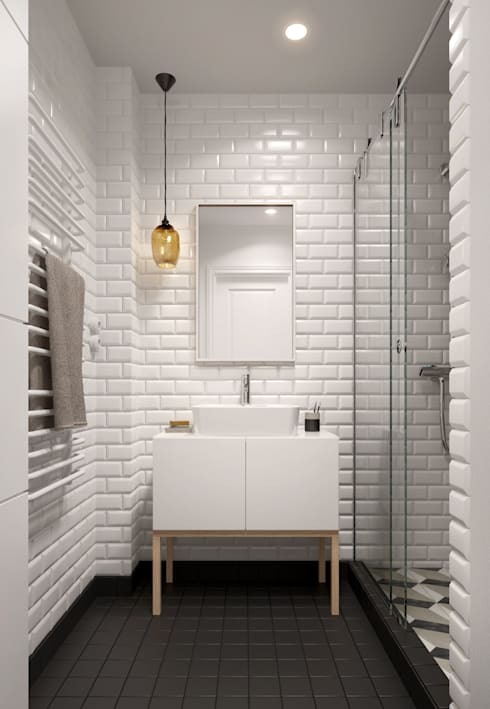 The brick-look tiles in this bathroom make a strong impact and give a chic-meets-rustic look to the whole space. 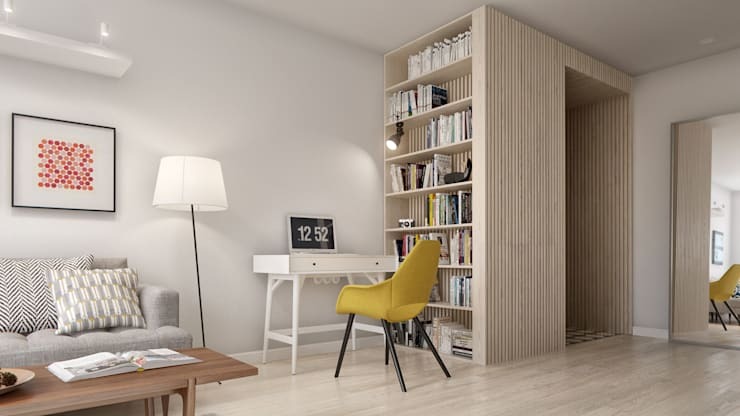 While the vanity conforms to a more Scandinavian look, it all strings together seamlessly. 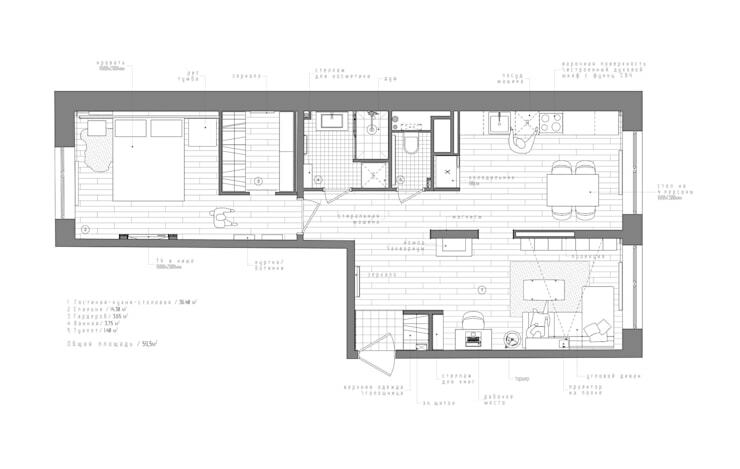 Last but not least, we're giving you a look at the floor plans in case you'd like to copy this layout yourself!